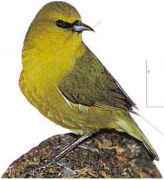 Being adaptable to a range of different types of forest environment, this is the commonest of the green honeycreepers found on the Hawaiian Islands. It is most often found in drier parts of the forest. It feeds on nectar from the flowers of trees, as well as insects. It has a complex, trilling song, delivered very softly, and a variety of thin, buzzing call notes. 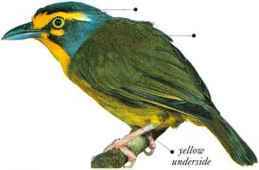 The male plumage varies slightly between islands, while that of the females is more varied. • NliST A small, cup-shaped nest, situated in a tree fern or small tree. 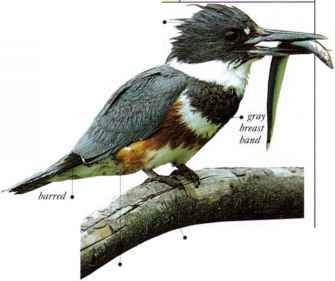 I his distinctive honcycreeper has red body plumage, black wings and tail, and a red bill that curves sharply downward. A nectar-feeding specialist, it is usually found high in flowering trees, although it keeps well hidden among the foliage. The Iiwi is slow and deliberate in its actions. • NEST An open, loosely-made cup, in a tree or bush. 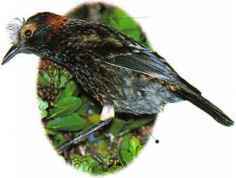 Also kn( ra n as Akohekohe, this species is found only in one mountain locality and is endangered. 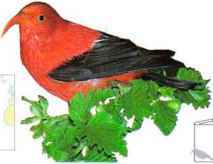 It is bold and active in behavior, feeding on nectar in the tops of tall flowers and trees, also taking caterpillars and mature insects. Its calls include a loud whistle. • DISTRIBUTION Halcakala Mountain on Maui. Hawaiian Islands. 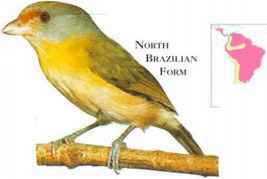 A bull-headed bird with a heavy bill, the Rufous-browed Peppershrike moves about sluggishly in the trees. Always keeping to the thicker parts of tile-foliage, it is more often heard than seen. Its diet consists of insects and caterpillars. • NliST A thin-walled, grassy cup, usually suspended from the fork of a high branch. • DISTRIBUTION Central America from S.E. Mexico to Panama, and parts of South America as far south as C. Argentina.